OpenDrive, a proficient and a renowned cloud storage corporation that enables you to securely store all your data over cloud account via protected method. With the help of their gigantic data centers across the globe, OpenDrive is able to provide unlimited cloud storage to their users at affordable prices – starting from $ 5 for 100 GB. With the help of skilled professionals employed at OpenDrive, they are able to provide a solution that sync all your files and folder on your system or any synced device. Its services are compatible with multiple operating systems – Windows, Andriod, Mac OS X, Linux, iOS, etc. OpenDrive owns a virtual structure and provides with multiple noteworthy cloud based applications. 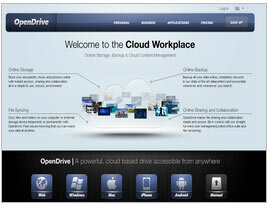 OpenDrive was launched in 2008, since then it become an eminent cloud storage company. It is persistant in delivering clients with satisfying solution for storage, sharing and backup recovery of their digital stuff.